Targeting STAT3 to overcome tumor induced immunosuppression and to enhance efficacy of immunotherapy. Immunotherapy for the treatment of cancer involves the use of pharmaceuticals or vaccines that can activate the body´s immune defense to attack tumors. The first approved immunotherapies have resulted in remarkable clinical results. Although these therapies have only worked in certain types of cancer and only for certain patients, it has led to a greatly increased focus on immunotherapy and there is now a great demand for new immunotherapies that work for additional types of cancer and for a greater proportion of patients. Finding novel ways of increasing the scope of immunotherapies could revolutionize cancer treatment. Tumors can escape the immune system, thereby not responding to immunotherapies, through several mechanisms. One of the identified mechanisms is STAT3 signaling. STAT3 can induce the proliferation of immunosuppressive cells which prevents immune cells from attacking tumors leading to tumor growth and metastasis. This makes STAT3 a very attractive target for the development of novel immunotherapies. Thus, inhibiting STAT3 can reinstate an effective immune attack on cancer cells. Glactone Pharma is currently investigating the potential of combining the company’s STAT3 inhibitors with immunotherapies to treat cancer cells that are resistant or respond poorly to existing immunotherapies. Initial studies have shown that Glactone Pharma’s STAT3 inhibitors, including GPA500, are effective in multiple immuno-oncology models: Reduction of immunosuppressive molecules, e.g. PD-L1 and IDO1 on cancer cells, inhibition of tumor induced MDSC differentiation of human monocytes ex vivo. ASCO 2015 “Reduction in PD-L1 expression by STAT3 inhibition with GPA500 in enzalutamide-resistant prostate cancer” (J Clin Oncol 33, 2015 (suppl; abstr e16075)). 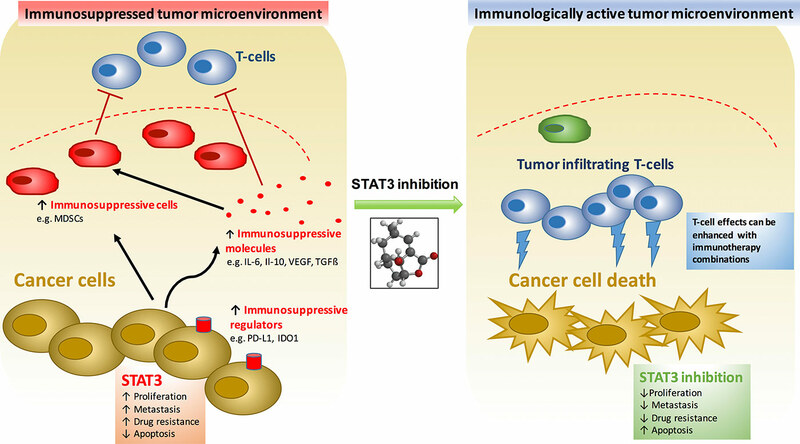 Figure: Inhibition of STAT3 signaling can restore an immunologically active tumor microenvironment and reverse tumor induced immunosuppressive mechanism.